Even before he was out of his teens, Ingles Buchan had already had a fairly eventful life: a college tutor at 15, he joined the army at 17 and narrowly escaped being bombed by a German plane before becoming an airman himself. After transferring from soldiering to the RAF, he was posted to the other side of the world, flying Spitfires from Darwin following fears that the Japanese had planned to invade Australia. Although enemy air attacks on the Northern Territory port continued for many months, an invasion did not materialise and Buchan was one of the fortunate who had a “good war” – bar a few more close shaves. He went on to enjoy a hugely-successful career in the textile industry, building an offshoot of the family business into the world’s leading manufacturer of tartan and then, in the best Borders textile tradition, establishing his own venture, Ingles Buchan Tartans in Galashiels, with an international clientele stretching as far as Australia. Born Robert Ingles Buchan – he was named after his maternal grandfather Robert Ingles, a Selkirk shoemaker credited with reviving the Selkirk Common Riding in the early 1900s – but known by all as Ingles. His paternal grandfather owned John Buchan Handloom Weaving and his father John was a textile trade union organiser. After the family moved from Selkirk to Galashiels young Ingles, though still being educated at school, also attended some classes at Galashiels Technical College. And after having to leave school the week following his 14th birthday, after his father’s sudden death, he studied there full-time when a family friend, who was also a mill owner, put him through college on a bursary. The college already had a reputation worldwide, with an international body of students, and the teenager began teaching his cohorts handloom weaving, earning 14 shillings a fortnight. Then in 1937, when the head of the weaving department contracted scarlet fever, the youngster was put in charge of the department while he recovered, cycling up to the Fever Hospital to take instructions – albeit at a distance of 30ft and through a security fence. At 15 he became the youngest student to pass his City and Guilds textile exams and from the technical college he went to work at Galashiels’ Buckholm Mill. Around this time his brother Morris, seven years his senior and who had inherited their grandfather’s weaving business, was asked to set up a new enterprise in the village of Lochcarron to help keep the local youths from leaving the area to find work. This was the beginning of Lochcarron Handloom Weavers – however, the Second World War soon intervened. Buchan, who had reportedly tried to join the King’s Own Scottish Borderers at 16, just the day before his 17th birthday, but had to wait to the following day to sign on, served in Glasgow before being posted to Wick Airfield to join the Searchlights. He was later on active service in Dundee when he narrowly missed being bombed and shot by an enemy aircraft, no doubt fuelling his determination to join the fight in the air himself. He applied to the RAF and was accepted in 1942, still only 19 when he began his initial training. After training in the United States, at the Gunter Field air base in Alabama, he returned to the UK and to an advanced flying unit. Subsequently, he was posted to Australia and No. 2 Operational Training Unit, Mildura, Victoria. He joined 548 Squadron in the spring of 1944, acquiring his own Spitfire VIII and being sent to Darwin that June. The fighter squadrons were detailed to defend the country from Japanese air attacks, but by this time major raids of the war had already taken place and the RAF only had relatively brief contact with the Japanese. However, the young fliers suffered various technical difficulties in the hot, harsh environment and there were a number of fatalities. Buchan, whose wing flew the rare silver Spitfires with the camouflage paint removed, suffered his fair share of scrapes. On the move to Darwin his wing was caught in high cloud and ran out of fuel before landing. All except one made forced landings in the bush. Four crashed, with two killed. He managed to stall land between trees on a cart track. The following month his aircraft came down on take-off after suffering engine failure and crashing into tree stumps, with full fuel tanks. He escaped with minor injuries and was flying again a few days later. At the end of the war he volunteered to help with the repatriation of prisoners of war from the Philippines and other Pacific islands, and on being demobbed returned to the Borders to join his brother who had also served in the RAF. Morris set up a branch of Lochcarron Weavers in Galashiels and made his younger brother a shareholder. While Morris concentrated mainly on the original family firm of John Buchan Weaving, Ingles Buchan spent the next 20 years putting his all into Lochcarron. He worked punishingly-long hours, took virtually no holidays and toured Scotland, islands included, for weeks at a time, visiting every Lochcarron customer, large and small. He built the company into a successful business which still exists today, although it is no longer in the family. Meanwhile, he had married Carrie, who he met at the wedding of one of the Scots RAF colleagues he had served with in Australia, and by the mid-1960s, he decided to leave Lochcarron and set up on his own. Ingles Buchan Tartans was born, with his wife as co-director. It was a huge commitment, as they had two sons by now, but they were not afraid of hard work and, once again, he put in long hours, working seven days a week for the next decade until the firm began to flourish. As success arrived the workload reduced, but the ethos of providing a superb service remained. It was not unusual to find him burning the midnight oil or working on a Sunday to fulfil a rush order. He could take an order on a Monday, source yarn, have the cloth woven and finished, sent to the tie-maker in Glasgow, made up, returned and delivered by the following Monday. 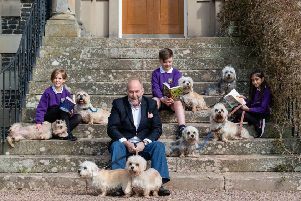 After 20 years establishing and expanding the business into an internationally-renowned company, he and his wife retired in 1987, selling the Ingles Buchan tartan firm which continues under new ownership, but still bears his name. Widowed in 2009, after more than 60 years of marriage, he coped with the loss by keeping busy, as he had done all his life, driving until he was almost 92 and enjoying his grandchildren’s perfomances on the sports fields or at pony club meetings, always ready to chat and deliver an endless stream of entertaining stories to a willing audience. He is survived by his sons Roderick and Lindsay, and grandchildren Georgia, Hugo, Kit and Brodie.